This was the best growing season in eastern Massachusetts in a long time. We had rain in the spring! No worrying about stress on the trees in April when it is supposed to rain but doesn’t, like many recent springs. And the rain continued steadily, but not too much, through July. At one point, probably in late June, I looked at the US drought monitor and nearly the entire country was drought free except for part of Montana. 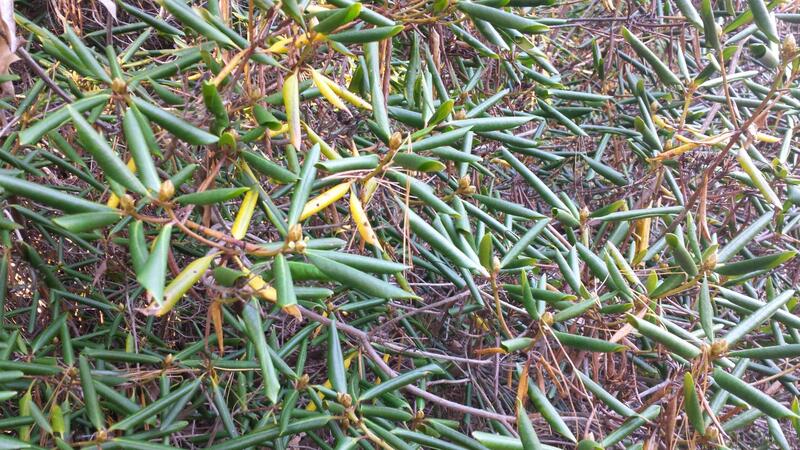 In spite of early-season rain, a rhododendron’s curled leaves show the effects of late summer drought. The rain made for a glorious landscape. As I walked around the meadows and wooded patches under my care this summer, awareness of the breathtaking beauty of the landscape actually managed to nudge past the usual running list of landscape flaws and tasks in my head that generally accompanies such a walk. Fruit trees fruited better than I have ever seen; bringing the feeling of abundance that motivates many gardeners. My exaltation this year comes despite the fact that I’m usually the person who says “now that we got all this rain the fungal diseases will take hold of the trees.” We didn’t even see the fungal diseases until late in the season but by that time I had already decided this was the best season ever. However since this is about the entire season, I have to admit that sadly Eastern Massachusetts is back on the drought monitor in “moderate drought,” and it is showing with the curled and yellow leaves of rhododendrons, among other signs in the landscape. 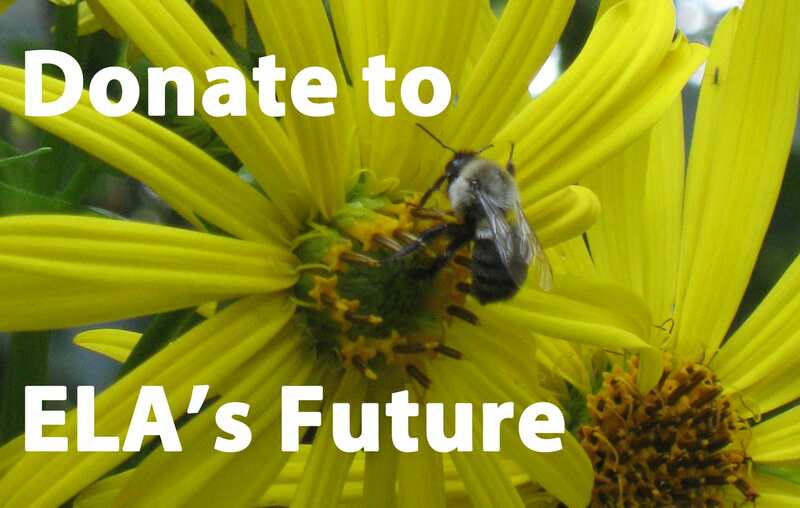 Since I knew I was writing this article, I started making observations in early April at both my home garden in southern Worcester County and at Wellesley College where I take care of the 22-acre arboretum/botanic garden. 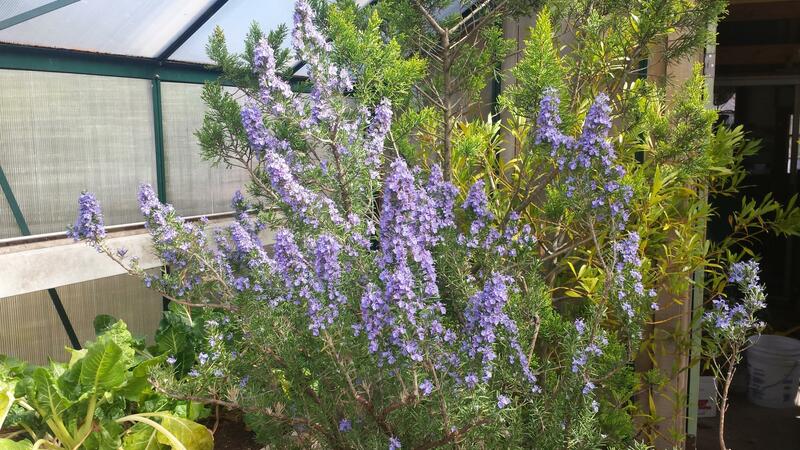 Last year, in early April, I was very happy to see bumble bees on a rosemary plant in my greenhouse, it even set seed. This year the same plant bloomed well again, but there were no bumblebees. So I moped around for a bit and decided that despite my best efforts to maintain a pollinator friendly yard all my bees had succumbed to one or more of the stresses we’ve put on pollinators. Then I went outside and found the bees. No bumble bees found the rosemary blooming my home greenhouse this year, but there were plenty of bees in the yard. They were all over the flowers of the ground ivy (Glechoma hederacea) that infests my yard. I was relieved and chagrinned at the same time. How could I continue my (losing) war on ground ivy if it supports pollinators when little else is blooming? So I started looking at the value of other plants in the wrong place, aka weeds. 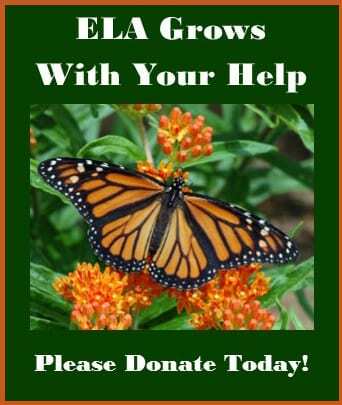 It certainly is not news to anyone that weeds are valuable to pollinators, but how could I tolerate large patches of weeds in spaces that I aspire to organize into well-maintained gardens? 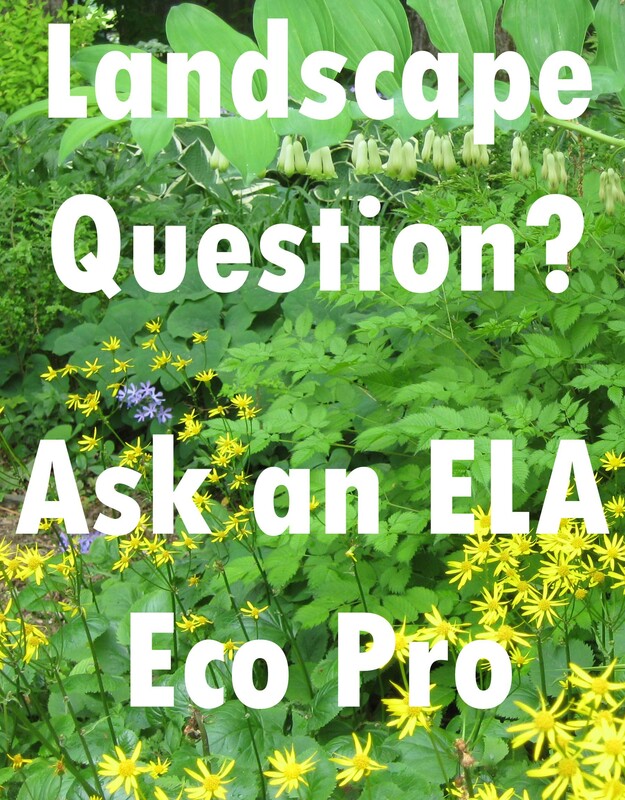 It is actually pretty easy in a large, multi-acre, naturalistic landscape but harder in a small garden. As aggressive as some goldenrod (Solidago sp.) 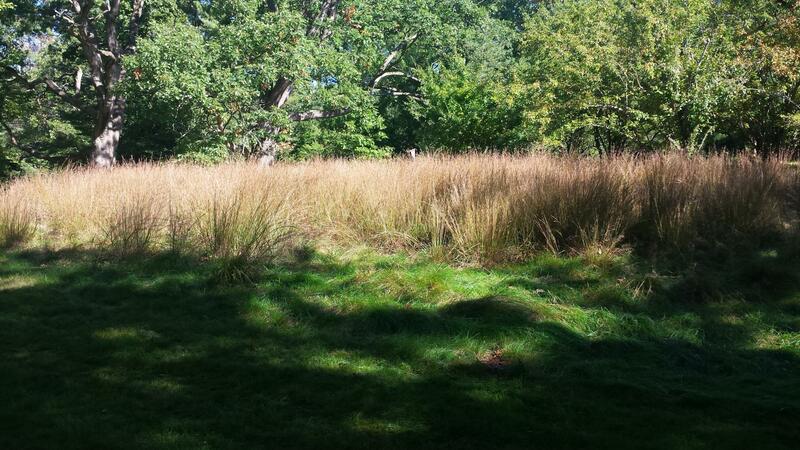 species can be, I think they are fine in a meadow. Crown vetch (Securigera varia) is attractive when flowering and covered by bees. At my smaller garden at home, I am resisting pulling jewelweed (Impatiens capensis) until after it flowers. 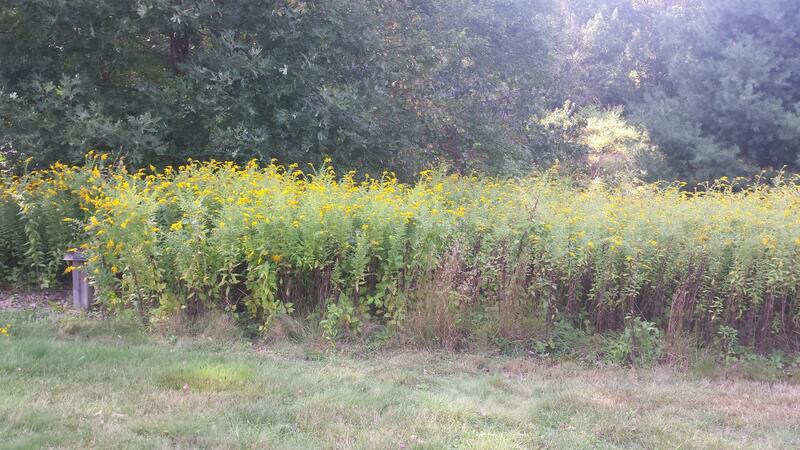 Goldenrod blooms spectacularly in a meadow at Wellesley College. My focus at Wellesley this summer was on projects other than mulching tree circles, so when I passed a Bald Cypress (Taxodium distichum) that had a relatively weed free circle around it I thought, “We didn’t mulch that tree.” Instead of mulch, it was cleavers (Galium aparine, a very useful herb) that had died back and made a uniform tan circle around the tree. I’ve also seen creeping jenny (Lysimachia nummularia) make a similar uniform mulch around trees, but since that is an invasive species it is a problem not a solution. Galium aparine provided a natural mulch around a bald cypress on campus. Clearing invasive multiflora rose made way for a resurgence of Polygonum pensylvanicum. 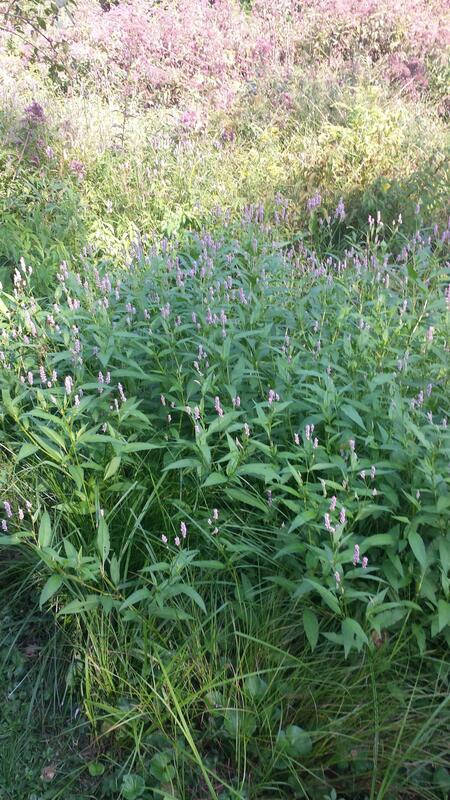 I also felt fortunate when Pennsylvania smartweed (Polygonum pensylvanicum) grew up from an area cleared of multiflora rose, making an attractive and bird-friendly patch in a wet meadow. I think the lesson here is that clearing the invasive rose early in the season gave this annual a chance to grow and reproduce, thus getting the disturbed area off to a good start toward succession. Although a solid stand of Schizachyrium scoparium has not prevented the spread of oriental bittersweet, it provides a beautiful meadow edge. Of course, too often the issue is undesirable plants in meadows. I am struggling to control oriental bittersweet in a meadow of cool season turf grasses that is developing a beautiful solid stand of little bluestem (Schizachyrium scoparium.) I mistakenly thought the little bluestem was inhibiting the germination of the bittersweet because there are only a few bittersweet vines in with that warm season bunch grass. This year I realized the obvious, that the bittersweet problem is under some old apple trees in the meadow and the little bluestem area is tree free. Birds in the trees depositing bittersweet seeds are the problem and little bluestem is not likely the solution. 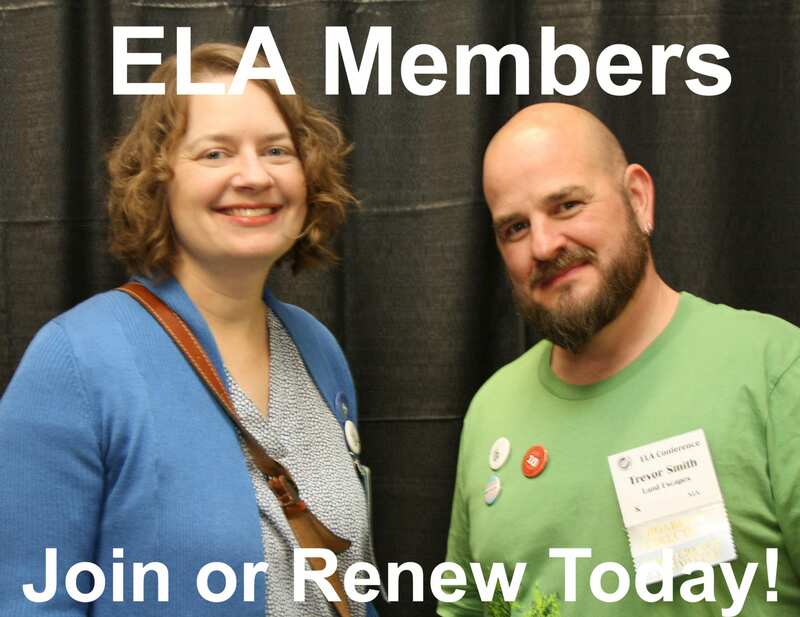 I am more focused now on developing a mowing schedule in spring and early fall to try to diminish the bittersweet and encourage a diversity of meadow grasses and forbs. 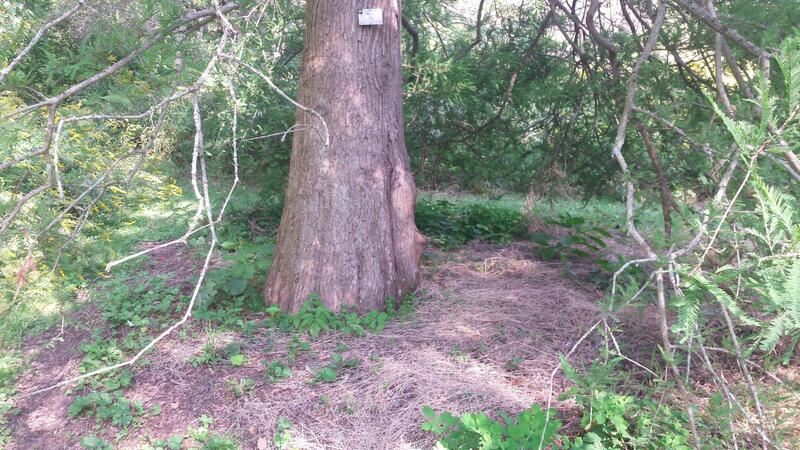 Gypsy moth caterpillars swarmed up this tree in Millis, MA and were a problem throughout the region. The most notable problem I experienced this season was the gypsy moth damage in parts of my range. I found myself cheering on a magnificent white oak from the privacy of my car as it started putting out new leaves after being completely defoliated by the caterpillars. 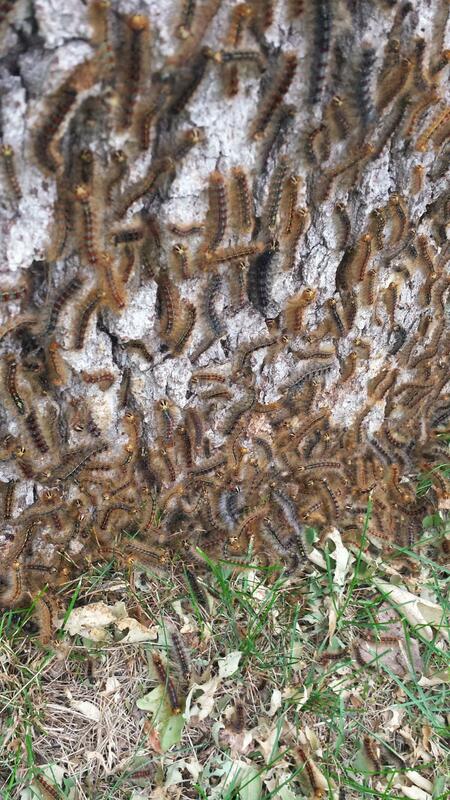 Other oaks were not as lucky, and they succumbed to the caterpillars, likely because of previous seasons of winter moth, gypsy moth and drought. But I am still left with memories of a wonderful season. 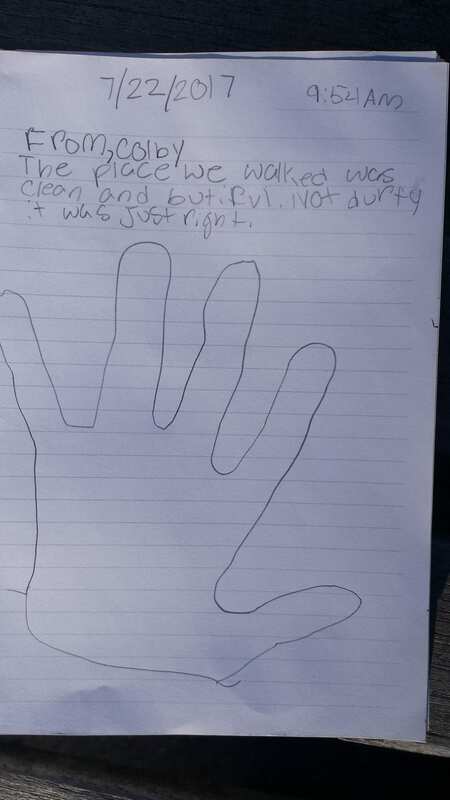 As this young visitor to the Wellesley College Botanic Gardens wrote: “The place we walked was clean and butiful. Not durty, it was just right.” I will take that as high praise for the grounds and the season. A note from a satisfied visitor echoed my own reflections on this year’s landscapes. The saddest memories from the season surround pulling apart Wellesley’s greenhouse gardens before the structure is demolished. 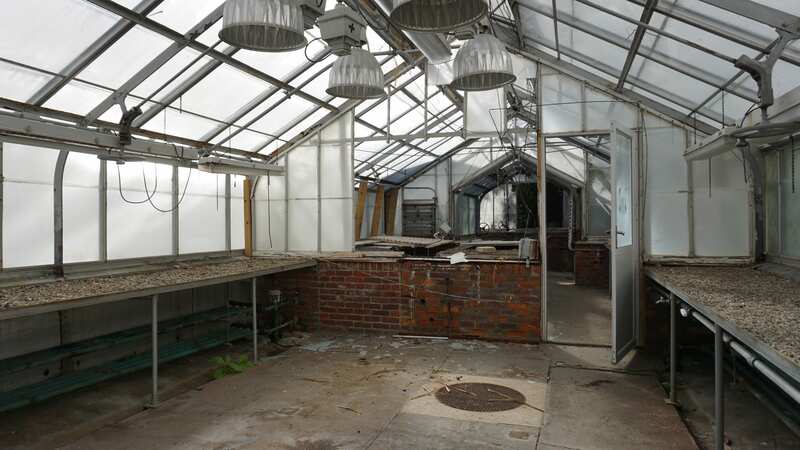 But wait…The other event that defined my season was the dissolution of the greenhouses at Wellesley College. It is so unusual and sad to undo a garden. As I write this, the greenhouse structure is a true ruin, and the few remaining plants are to be bulldozed after the structure is demolished. Whenever I see or think of ruins in the landscape I think of the title of an essay by J. B Jackson “The Necessity for Ruins.” I almost think it is better not to read the essay and to conjure up your own thoughts as to what ruins mean to you, but in this case the content of the essay has some bearing. “The old order has to die before there can be a born-again landscape.” 1 Soon enough there will be a new order to replace the old at Wellesley. B Jackson , The Necessity For Ruins and other Topics, (The University of Massachusetts Press, Amherst, MA 1980), 102. Tricia Diggins has worked at the Wellesley College Botanic Gardens for 27 years. 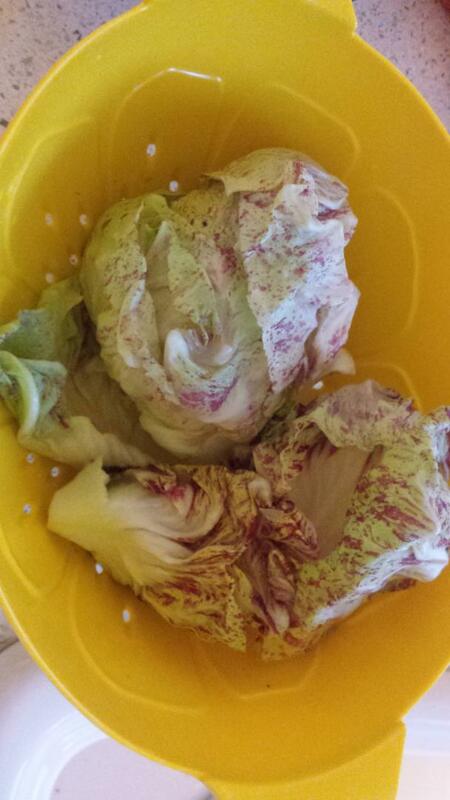 An avid home gardener, she decided that the bel fiore radicchio grown this year in a hugelkulture bed is the most beautiful vegetable ever.